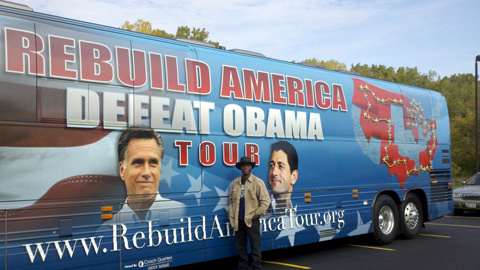 Our Rebuild America Defeat Obama Tour rally in Mount Pleasant, MI was held in a charming throwback hall. Mirrors covered the walls. Decorative small light bulbs wrapped the columns and strategic spots around the room creating a warm friendly setting. To my surprise among the sea of patriots, I noticed "Obama/Biden" signs held above the crowd in back of the room. A day or so before, in Grand Blanc, MI we encountered obnoxious protesters, half of which were black. The black Obama zombies called me a traitor to my race and other assorted insults. I was aggressive and confronted the brain-dead racists head on. So, when I saw the Obama protesters displaying their signs in back of the room, I wanted to verbally attack them from the stage. But, a still, small voice inside of me said, "Don't do that. Simply tell your story." I shared with the audience my family's history of government dependency and the devastating negative effect cradle to grave welfare had on many of my relatives. In 1956, my black dad broke the color barrier and became a Baltimore City firefighter. This afforded my family funds to move out of the projects and off of the government system. Unfortunately, many of my cousins/relatives stayed on government welfare their entire lives and it destroyed them. Throughout my speech and during the speeches of other speakers at our rally, to my amazement I saw the Obama protesters applauding along with our audience. The grand finale of our rallies is a military tribute which blew away the Obama supporters. They rose to their feet applauding along with our enthusiastic patriotic audience. Now, I am not saying the Obama supporters were converted to Romney/Ryan supporters. I am confident that they heard indisputable truths and felt inspiration and love for the greatest nation on the planet. Donald, a member of our team said he noticed that everyone at our rally was polite and non-confrontational with the Obama supporters. Had the situation been reversed, Romney/Ryan supporters showing up waving signs at an Obama rally, unquestionably the Romney protesters would have been putting themselves at great risk of physical harm. The mainstream media despicably continues to lie attempting to portray us as violent racist haters. With over 300 tea party rallies nationwide under my belt, I can testify that we tea party folks are extremely peaceful patriots who love God, family and country. In short, we are the good guys. I am confident the good guys will win in November.